Houston area residents are no strangers to cockroaches. In fact, in a recent study, Houston has one of the highest percentages of households reporting issues with cockroaches. Contrary to certain stigmas, cockroaches do not choose only dirty homes to infest. In reality, any household can be vulnerable to cockroach invasions. So how do full scale infestations happen? To understand that, we should take a look at how and why cockroaches find their way into your home in the first place. Why Do Cockroaches Invade Homes? Cockroaches often migrate indoors chasing three things; food, water and warmth. While the things like half eaten bags of potato chips scattered about will certainly attract cockroaches, the same is also true about even tiny bits of food and water. Appliances like dishwashers and stoves, if not kept extremely clean, can also attract these unwanted pests. Cockroaches are small and cunning, a great combination making them very good at getting into your home. These pests are great climbers and can run across things like walls and ceilings extremely fast, so any small cracks or openings are perfect entry points. Also, some roaches can fly through open doors and windows, or more vulnerable areas like chimneys or rooflines. In addition to invading your home, cockroaches are also known to hitch rides on things like bags, clothing, and other items. Second-hand appliances and other items are good candidates for cockroach transport. It’s also possible to track cockroach eggs in by simply stepping on them and, since these eggs don’t require a parent to hatch, they can hatch inside your home. While a dirty, cluttered home is not the only reason cockroaches decide to invade, it does make it a lot easier for them to hide and multiply. Cockroaches multiply at an alarming rate. In one year, a single pair can produce up to 400,000 children. Paired with the fact that most roaches are fully matured in 35 days, this can spell disaster. 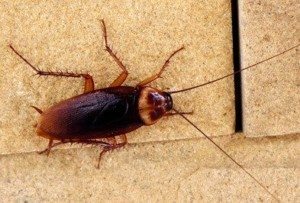 While it’s difficult to keep cockroaches out, the faster you identify an issue and contact a professional, the less chance you have of a full on infestation. If you suspect you may have a problem, contact Holder’s Pest Solutions right away!